On the photo: Director of international cooperation K. Movchan presenting the Saint Petersburg medical-pharmaceutical cluster at the project accelerator day 6th june. 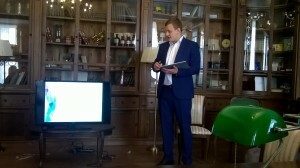 A well visited ScanBalt Business Club project accelerator day 6th June hosted by the Saint Petersburg State Pharmaceutical and Chemical Academy led to intense discussion on potential viable ideas for cross-border collaboration in the Baltic Sea Region. The project accelerator day presented the many high level competencies within the Saint Petersburg medical-pharmaceutical cluster via excellent presentations delivered by company representatives and researchers. A specific objective was to identify project ideas which may be suitable for co-funding from external resources and integrating the regional competencies closer into BSR collaboration. A topic to be discussed further as follow-up is the development and commercialization of pharmaceuticals derived from medicinal plants as the Saint Petersburg State Pharmaceutical and Chemical Academy already is planning to develop a screening platform for plant based compounds. The day ended with a visit to the regional administration and fruitful discussions on the future with the vice governor of economy Mr Sergei Movsthan.